Do you want an interesting background but fret that it is distracting from your message? 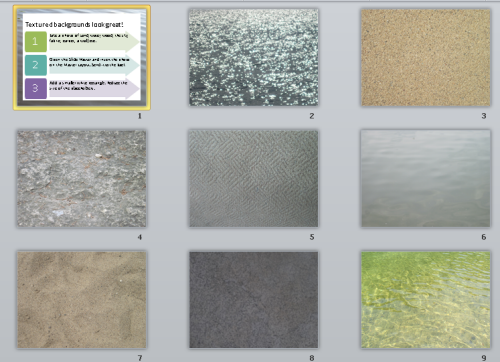 One way to resolve this conflict is to use a textured background around the edges of your slides. Here’s an example. The slide provides the steps, but I’ll explain them in more detail. Take a photograph of something that has a nice texture. Another source is Stock Xchng’s abstract textures. Open the Slide Master (View tab, Slide Master). Click the top thumbnail in the left pane (the Master Layout). I sometimes call this the Master’s Master, because it controls formatting for all of the layouts in the Slide Master. Insert the photo (Insert tab, Picture). Now, it covers all of the placeholders. Right-click the selected photo and choose Send to Back. Still in Slide Master view, click the Home tab. Click the Rectangle shape in the Drawing group. 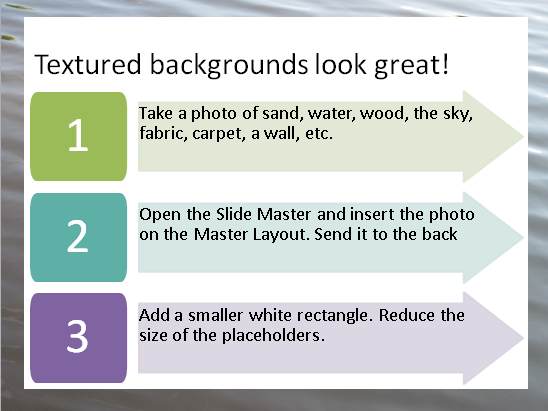 Drag a rectangle across the slide so that it leaves a border around its edges, showing the textured photograph. You can use the top-left corner of the title text placeholder and the bottom-right corner of the body text placeholder as your corner points. Use the above image as an example to resize and move the rectangle into place. You need to move the rectangle behind all the placeholders but in front of the texture photo. The quickest way is to right-click it, choose Send to Back and then right-click again and choose Bring to Front, Bring Forward. Readjust the size of the placeholders to make them slightly smaller. If you don’t do this, your text will seem to crowd the edges of the white rectangle. In other words, your text needs more of a margin around the edges. For the title text placeholder, adjust the top edge downward slightly and do the same for the left and right sides. Adjust the body text placeholder accordingly. Here you can see some other photos I’ve taken that could be used as textured background frames. makes the slides alive. Super. For novice like me, great help!! Great tips here. It never crossed my mind to take a picture of something textured for use as a frame. I can only imagine the possibilities, based on the topic of the presentation. (Carpet was particularly interesting, haha). 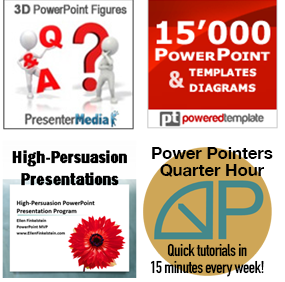 This is really helpful for beginners who want to break free from pre-packaged presentation templates.